Quilting Gallery Blog Hop Party Giveaway! Thanks for joining me for the Blog Hop Party and Happy Holidays. Grab a cup of hot spiced cider, some toffee (or at least the recipe, which you must try - it's easy and decadent), and enjoy your time with me today. If this is your first visit to Because I'm Me welcome and please take a look around. It's great to have you here. To introduce myself, or reintroduce myself if you're a regular visitor: My name is Jody, I live in south Florida, go to the beach on Christmas day, and sew whenever I can find the time, having begun sewing with my mother when I was 10 (stop trying to do the math, just go with "a long time"). Quilts are my favorite thing to make, but are by no means all I make as you'll see here and in my shop. I have six lovely children who are currently crazy for Christmas and thrilling me with their youthful enthusiasm. I home school four of my kids, one is in college, and the other is potty training. I also run the blog Because I'm Frugal, where I share what I know about saving money. Ended 12/17/11 After meandering through Because I'm Me please click the banner (above left) to visit the rest of the Blog Hop blogs and enter their give-aways. Ended 12/17/11 Today I am giving away a beautiful handcrafted coaster set. 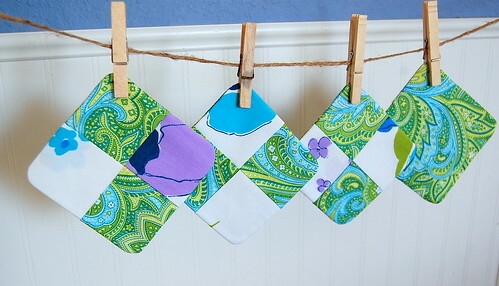 The set contains four beautiful coasters created from two complimentary cottons, one a blue/green paisley, and the other a very large scale blue/green/lavender floral. I use two sets of these coasters at home and they're awesome - super absorbent and machine washable. To enter, simply leave a comment below, with an e-mail address. The contest begins today, December 9th, and runs through December 17th. A winner will be announced on Sunday, December 18th and I, ever the merry elf, will contact the winner by e-mail at that time. If you fail to leave an e-mail I can't count your entry, so please leave that e-mail! If you can't wait and must have a set of these awesome coasters now they are available in my shop in the "coasters and table decor" section. First time visiting your blog. FUN!! what a cute give away. I'm in NC, but we used to live in S. FLa almost 8 yrs ago... I lived in lake worth, before that deerfield bch- powerline rd and sawgrass entrance..... where are you at? Thank you for the chance to win such nice coasters. I love the colors....they remind me of the beach. Lovely coasters....thanks for the chance. me paracen muy bonitos espero tener suerte esta es ///MI PRIMERA VISITA A SU BLOG .//GRACIAS. desde ESPAÑA. pilarsalvo@hotmail.com. I love your coasters. I home schooled my kids too! They're 29 & 30 now! very pretty, thanks, I would love to win these! Very pretty coasters,thanks for the chance to win them.My email is in my blog profile :) Barb. First time visiter. I'm very jealous being from South Jersey, it's getting pretty chilly here. The only time we're on the beach for Christmas (actually NYE) is the polar bear swim! Hi,thank you for offering the coasters they are beautiful. Happy Holiday to You and Yours. Those coasters are very pretty, thanks for the chance. Sweet Coasters. Thanks for the chance to win. Your coasters are so bright and lovely! We have similar lives 5,000 miles away in tropical climates! love the colors of those ! catherine.quille @gmail.com ... that's me ! Love your colours! Thank you for the opportunity. The handcrafted coaster set is just beautiful. I would be honored to receive such a gift. Thank you for a chance to win. I have never to Florida but some day in the future I sure hope to go. I am from California in the foothills. You know, sunny California but not so sunny today. Sort of cold and weiry. I think you made these for me ;) they match my living room so well! I would love to win, thank you so much for the chance! Lovely coasters. The fabric in the one to the right is the whole back of my California King quilt. I LOVe that fabric. Thanks for the chance to win. Those are cute! Thanks for the giveaway chance! Gorgeous coasters. Thank you for being part of the giveaway. Hi - love the coasters. SIX kids!!! OH MY!! You are BLESSED!!! this is my first time visiting you...actually, I have just discovered how much FUN blogging is. These are cute. Would love to win. Sweet! !Thanks for the generous giveaway! Pretty colours. Thanks for entering me in the draw. Big_dog_max at yahoo dot com. I am your follower and this is a awesome give-a-way...have a wonderful holiday. Great coasters, thanks for the chance to win! The coasters are so pretty. Nice coasters. Thanks for the giveaway. You must not sleep if you find time to quilt with six children! LOL I'm sure you need your quilting time as we all need time for ourselves. Love the coasters and love your enthusiasm for all things family. Such happy colors you used! Thanks for the Opportunity to Win!!! Cute, cute, cute! Thank you for the opportunity! The coasters are very nice. Thanks for a chance to win. Lovely coasters, all in my favorite colors. I could not help noticing your beach photo. I lived in Sarasota, FL for many years, my sis and parents are still there. They have the best beaches there. Now I have to go visit your shop...if you have these fun fabrics...you're probably making more fun things with it too. I have just become a follower because I like what I see!! Thanks for your give-away. I also have a created gift on my blog as a prize. These are very pretty coasters..thanks for the chance to win! I love those coasters. how pretty! So cute! Love your work and am a happy follower now!